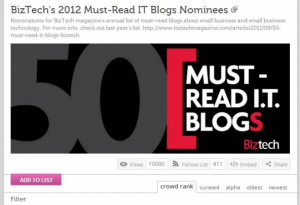 List.ly is a list building website that allows you to build and curate shareable lists. These are then viewable by others. People can ‘like’, ‘dislike’, comment or even add items to the list. This results in a list that re-organises items based on their popularity. 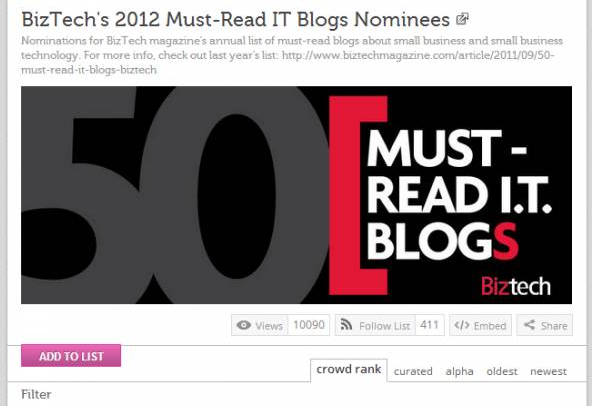 You can then embed these lists in your website or blog. So, rather than directing traffic to lists you’ve built on Facebook or Twitter, you can keep that traffic on your own site! One of our first principles of marketing: build your own audience on assets you own. Creating lists is simple. Go to the list.ly site and click create a ‘new list’, then put in a name and description. Then all thats left is to add your content, simple. By delving into the advanced options you can also create branding on your list. The advanced options allow you to add tags, a header image and links back to your website. This means that Listly will also help you promote your brand through the header image, and also give you another backlink to your website. How can brands and agencies use List.ly? There is huge potential for brands to leverage Listly in order to gather customer feedback. Feedback is key in developing new products or making adjustments to existing products. Listly can be leveraged to create feedback, and even to get new insights into what your customers want. Simply create a list of your products (or even future product ideas) and watch how customers interact with it. They will vote up the products they like, and vote down the products they don’t or they can leave comments. In addition to this give them the opportunity to contribute their own ideas. If they add something to the list that resonates with your other customers it will climb up the ranks and give you new products/developments to consider. The best part of this is that not only are you getting ideas that your existing customers want and will buy, you’re getting them for FREE! As a bonus you will also receive alerts from Listly when someone adds an item to your list. So you always know when something is added to your list, as well as who added it. You can also follow other peoples lists. This feature helps you to stay up to date with the how lists you’re following are changing and the new ideas that are being added. Creating an industry specific list of tips allows you to easily find out what content your followers engage with the most. By following what tips people are voting up or down you are able to see what they want to know more about. This allows you to better plan out your blogs to appeal directly to your audience and will help to prevent you wasting time producing content that your audience isn’t interested in. These ideas only highlight some of the potential that list.ly can offer in terms of content and product development strategies. Do you have any other strategies? Have you used list.ly? Let us know your thoughts. How’s this for a neat idea? You pitch us in order to win our attention and get your marketing services free by reversing the traditional RFP process. The Brand pitches the Agency. Well, I’m not offering it just now but Hart is inviting prospects to submit their ideas by 30th November, 2012. could be the best new marketing move you make in 2013. Over the last one year, we have been thinking hard about what we’re doing. We’ve seen ups and downs in the last 10 years of Law & Kenneth, and if at all we’ve created something (besides brands), we’ve created an organisation, of which 300 people and their families are a part. We wondered if this was all we could do. Ten years ago, when we started off, we were at a certain point. There are many, many people with ideas today that can lead to viable business, and can be ideas around doing business for social good. They also need to be ideas that are innovative in nature. We wanted to build something that would outlive us. We met Hayden Raw from The Common Room recently and they are also looking at ways to innovate. Hayden told us, he looks to invest a portion of their client fees into kick starting young entrepreneurs. Is a reverse RFP a gimmick? Yes, it almost certainly is a promotion, a publicity stunt or a gimmick. But it’s a very valuable one for the winning brand team. Many agencies take on pro bono clients for whom they work for low or no fee – what’s different is using this as part of their own promotion. We have all whined about a client who was too conservative to buy our ‘great concept’ and so it’s possible by delivering your services under non-traditional fee arrangements, then you have greater leverage to encourage the brand to choose the most risky / creative / far-out communications campaign proposal that you present. Last year I visited my parent company and the biggest change I noticed was hiring people working on social media. I wanted to know why the biggest companies were going to spend money on social media -they are ready for it. Then I decided to split it in two – to get a sense of the text and the tweets – I spent 3 months in development and read a lot of articles about it. I had to reject the project becuase it didn’t work. It didn’t work as well as I expected. On the other side – I was looking for the best analysis soutuion for social media – I found Avinaush’ Kaushik’s blog “Occam’s Razor” and his articles. His simple dashboard was reliable for us. So I created a small website with a simple dashboard. We showed it to Avinaush and we had a couple of weeks of conversation about what it has to be able to do to work well. 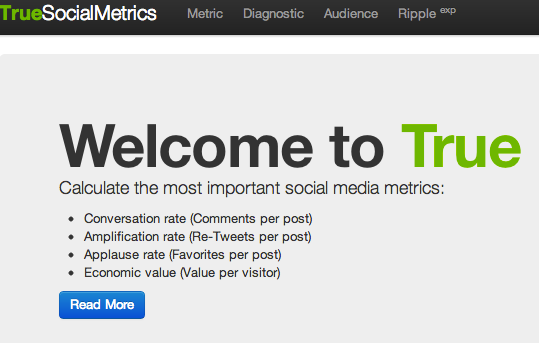 The original name was V-Tag but Avinaush proposed the more familiar name ‘true social metrics’. It’s a free service. I worked on it in my spare time and weekends. I am working on it – I’m getting customers to pay for API access and are working with me. I’m working on integrations with this. It’ll sell for a monthly fee. I have lots of tasks – people asking for Instagram integrations and other tools. It’s very useful. I have 66 tasks for the next time we speak! I am still working for ODesk and I have an agreement for the past 2 weeks that they give me 2 months free time. After the success of the first Battle of the Brands post, I thought I would revisit the subject, but this time use the heavy weight of New Zealand, in terms of social media engagement. The brand I am referring to, of course, is the All Blacks. With 1.87 million likes on Facebook and 170 thousand followers on Twitter, they are, by a long way, New Zealand’s most followed brand. But how does their social media engagement stack up against some of the other top sporting brands in the world? Step up to the plate, England Football Team and the Dallas Cowboys from the NFL. As we did last time, we will be looking at how these sporting brands engage with their huge number of followers/ likers and critiquing who does it best, as well as providing our suggestions for improvement along the way. The All Blacks numbers speak for themselves, they are a head above any other NZ brand on Facebook or Twitter. I’ll start with Facebook. Their Facebook page has just over 1.87 million followers (at time of writing) with an average of 50,000 Facebook users talking about it at any one time. They use the ‘favourites boxes’ in a basic but effective way, including; photos, videos, online store, E-calander, Youtube account, events, live streaming and an RSS blog feed. Possible improvements here could be a competition box/giveaway box, or a Fan Photos box offering high quality All Blacks photos for fans to use as their own cover photo on Facebook. They average 3 posts on any given day but this can change if events are happening or important news is being circulated. Every post includes a photo or video/news link as well as posting polls and finishing all posts with a question of sorts. One of their most popular posts of late was ‘Who has the better signing pose, Ma’a or Dan?’ and includes a photo of the two players signing jerseys at school event. It is very simple, asks a question and has a photo. A great way to get involved and engage with their fans. The post received almost 3,000 likes and 400 comments.